Today, as part of their launch, I’ve allowed Angela to “hijack” my blog as part of the festivities they have planned. As we storytellers sit before the keyboard to craft our magic, we’re usually laser-focused on the two titans of fiction: plot and character. Yet, there’s a third element that impacts almost every aspect of the tale, one we really need to home in on as well: the setting. The setting is so much more than a painted backdrop, more than a stage for our characters to tromp across during the scene. Used to its full advantage, the setting can characterize the story’s cast, supply mood, steer the plot, provide challenges and conflict, trigger emotions, help us deliver those necessary snippets of backstory…and that’s just scratching the surface. So the question is this: how do we unleash the full power of the setting within our stories? Well, there’s some good news on that front. Two new books have released this week that may change the description game for writers. The Urban Setting Thesaurus: A Writer’s Guide to City Spaces and The Rural Setting Thesaurus: A Writer’s Guide to Personal and Natural Spaces look at the sights, smells, tastes, textures, and sounds a character might experience within 225 different contemporary settings. And this is only the start of what these books offer writers. In fact, swing by and check out this hidden entry from the Rural Setting Thesaurus: Ancient Ruins. And there’s one more thing you might want to know more about…. 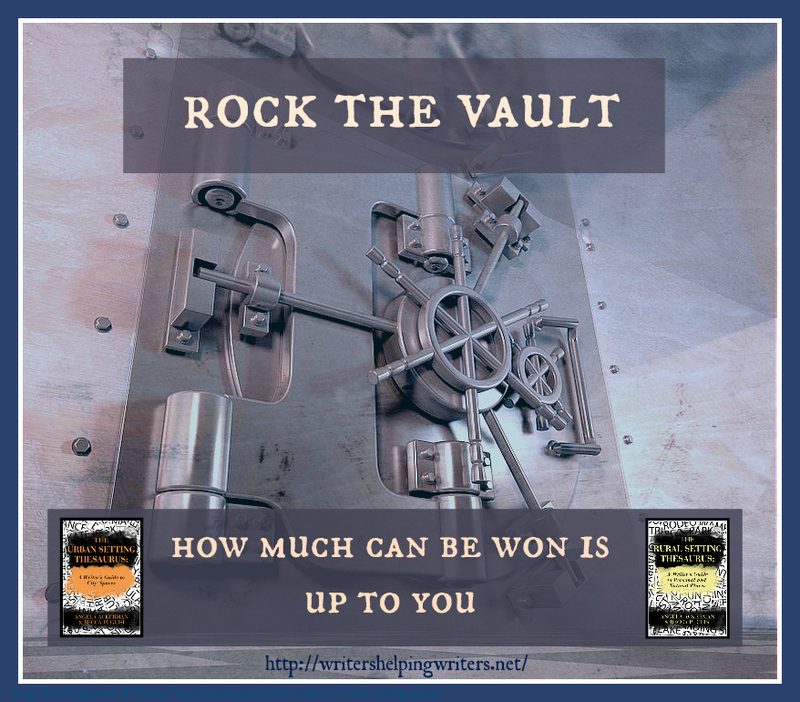 Becca and Angela, authors of The Emotion Thesaurus, are celebrating their double release with a fun event going on from June 13-20th called ROCK THE VAULT. At the heart of the Writers Helping Writers site is a tremendous vault, and these two ladies have been hoarding prizes of epic writerly proportions. A safe full of prizes, ripe for the taking…if the writing community can work together to unlock it, of course. Ready to do your part? Stop by Writers Helping Writers to find out more! Last month, I talked about how to find the right cover designer for our project. Unfortunately, once we’ve selected our cover designer, it doesn’t mean everything will move forward smoothly or well, even if our cover designer is both talented and professional. Why? Well, a business relationship is still a relationship. That means a large part of the success of the relationship depends on communication. We need to clearly communicate our needs and desires to our cover designer. So this month I’m sharing my top seven tips for making the most of working with a cover designer. I hope you’ll join me at Janice Hardy’s Fiction University for my 7 Tips to Make the Most of Working with a Cover Designer. If you’re not in need of a cover designer at present, I also had another post up this week at Writer’s Helping Writers about how to decide how many point-of-view characters our book needs. And remember, if you have a question you’d like me to answer or a specific topic you want me to cover, contact me. I’m keeping a file on questions to answer here on the blog in the coming year.